Hey guys! 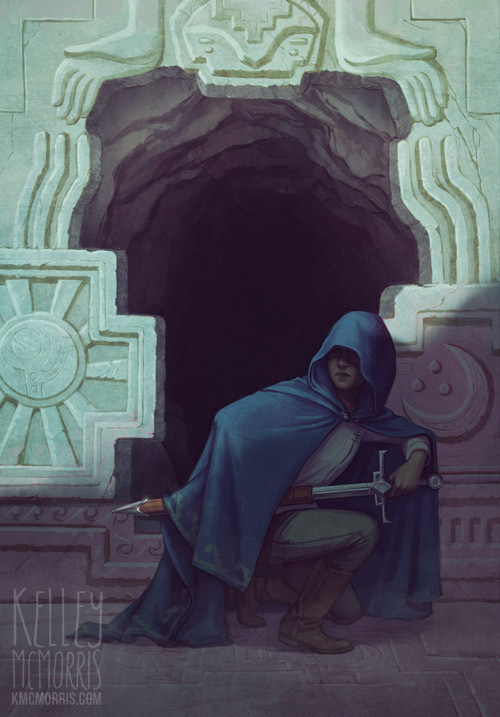 I'm excited to show you this book cover I did. 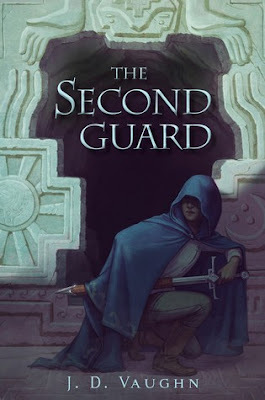 This is the cover for The Shadow Guard, the sequel to The Second Guard, written by J.D. 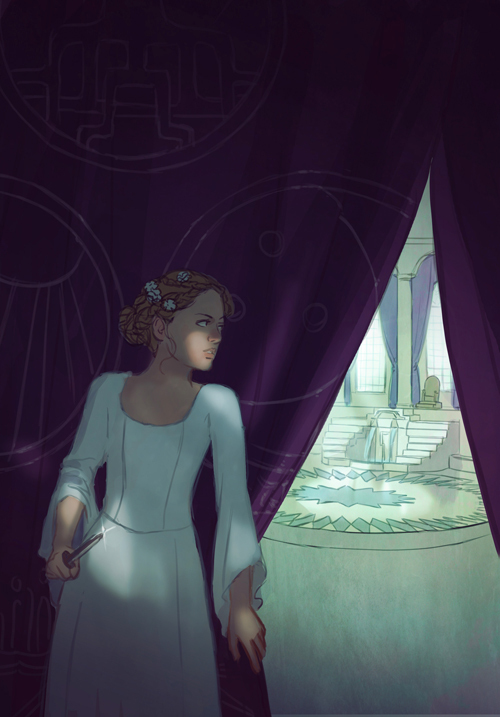 Vaughn, published by Disney-Hyperion and art directed by Joann Hill. I'm a fan of this series because it's a girl-centric YA fantasy set in a unique, mezo-American-inspired world. Admit it, that sounds pretty cool. I like YA novels about girls who do things other than fall in love with hunky boys. A little romance is cool but I can only take so much gushing about some 17-year-old's smoldering eyes and glistening copper skin. If you read YA, you know what I'm talking about. 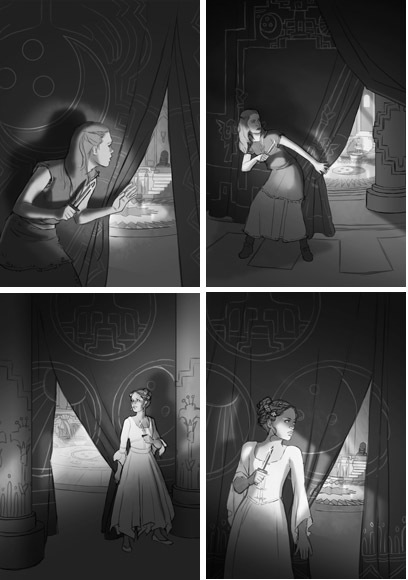 The art director, Joann Hill, told me that the second book in the series is centered around palace intrigue and plots. 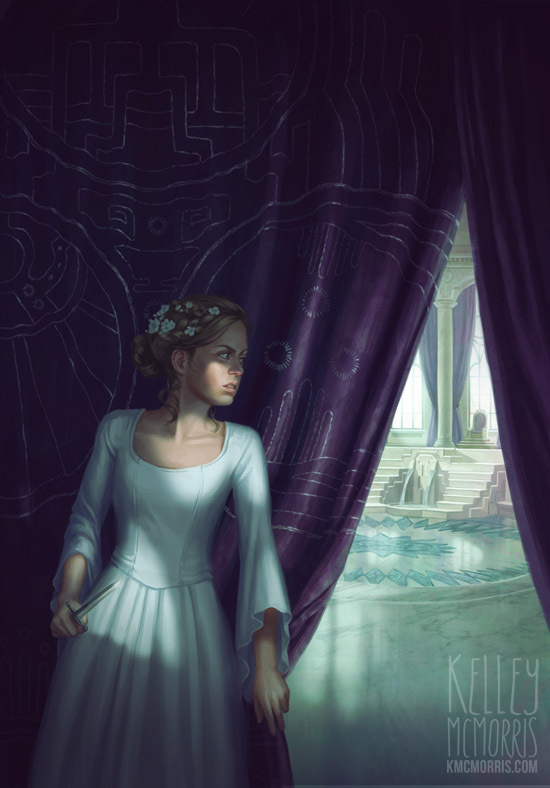 The team wanted to have the main character, Brindl, (different girl from the first cover) sneaking around the royal palace, in front of a curtain, holding a knife. They wanted the same teal-purple color scheme as the first cover, and dark, dramatic lighting. 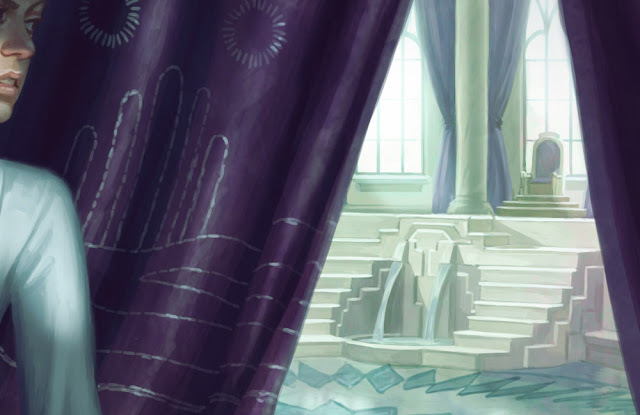 They also sent over a very detailed description of the "light-filled" throne room. 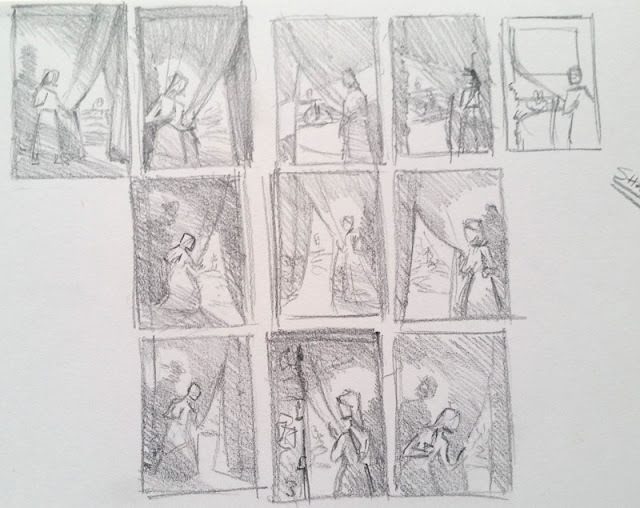 Here are some of my thumbnails. I played with different poses one could use for sneaking around a curtain, and a few different costume choices for the main character. 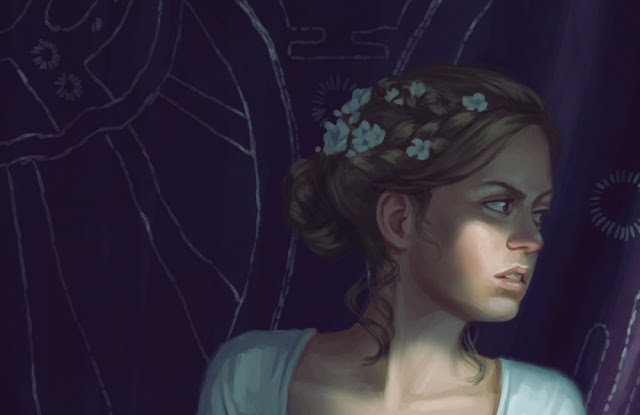 I also used a dramatic spotlight that would create big, looming shadows. Since a defining element of the first cover was the elaborate carved designs in the wall, I tried to echo that design element here by including carved designs on the pillars and embroidered designs on the curtains. 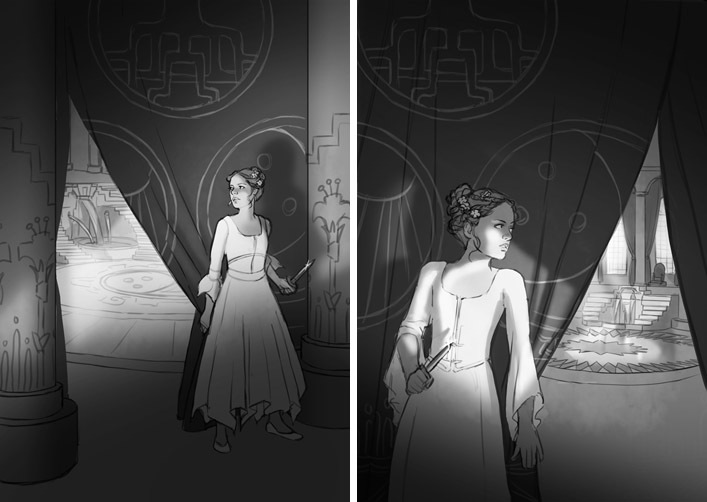 I originally developed these designs for the first cover, using the mythology of the book. The team asked to see revised versions of the last two roughs, with Brindl's hand in slightly different positions. The team decided to go with the second rough. They asked me to decrease the amount of light on the character, so she was just barely highlighted, and make a few adjustments to her hair and costume. Here's the color rough that I sent them. I was approved to go to final! A few tiny tweaks of the lighting and the character's expression, and we were done! Here are the two books side-by-side!! Ahh it's so satisfying seeing them right next to each other. 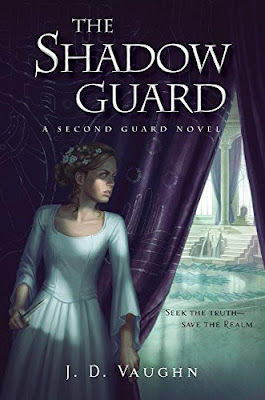 The Shadow Guard comes out on September 13! You can preorder it at Amazon. I highly recommend it to any readers of YA fantasy who are looking for something fresh and different.